Conceived as a hotel with the spirit of a hostel - communal, inspiring, and inviting – the Freehand Los Angeles is Roman and Williams' third Freehand creation. Dreamed as a space where travelers can converge to share ideas, stories and dreams, Freehand LA was inspired by a community that forges its own path. Roman and Williams collaborated on all aspects of the creation of Freehand, including the naming, branding, and its concept built upon a "free to be you and me" credo. Originally completed in 1924 by architecture firm Walker & Eisen, the building belonged to a publishing company run by Edgar Rice Burroughs, author of “Tarzan.” It boasts original architectural details, such as vintage owl-adorned tiles from the 1930s when The Owl Drug Company occupied the space. 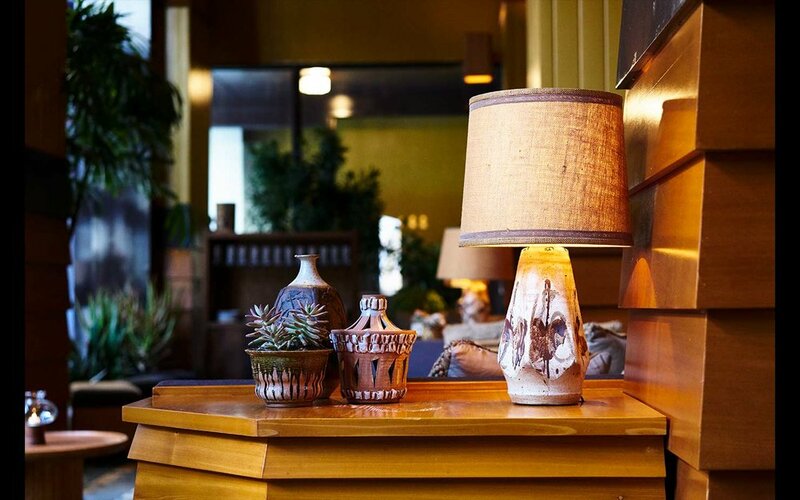 A collection of ceramic owls in the bar area of the lobby honors this history. 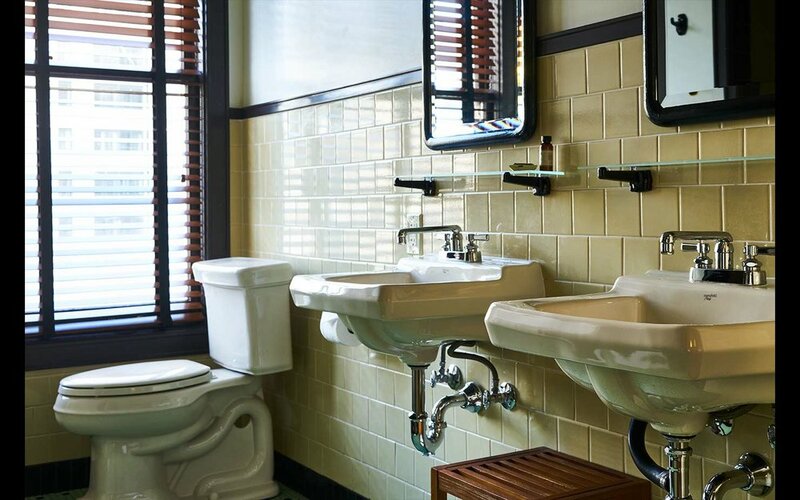 The marble corridors and traditional shell of the building embraces the 1920’s classic vernacular, while the furnishings and elements added by Roman and Williams reference a crafted California ideology. When you peer inside the grand storefront, an expansive space lies ahead with shingled sofas, custom wooden lights, a collection of ceramics, and green plants; dynamic references to the Arts and Crafts Movement, as well as California’s desert environs. 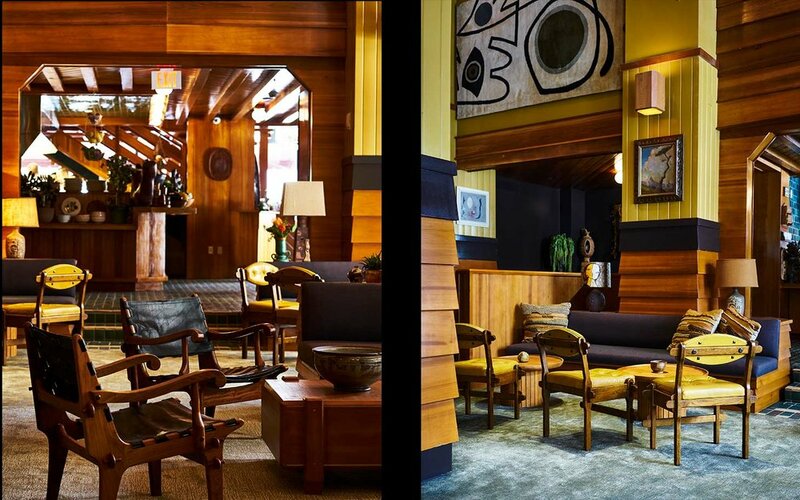 Roman and Williams again collaborates with Bar Lab to create the lobby’s bar and restaurant, The Exchange. A palette of brilliant and intense colors of contrast run throughout: deep teals and golds. Custom muslin fabric and wooden light fixtures float atop the ceilings as though they are in the sky; the lights are grand glowing structures. A rooftop pool and its bar, the Broken Shaker, offers an expansive city view that is urban yet earthy, along with a garden. Overgrown and colorful, as if you were in the California hills and its flora, creating a potent combination. 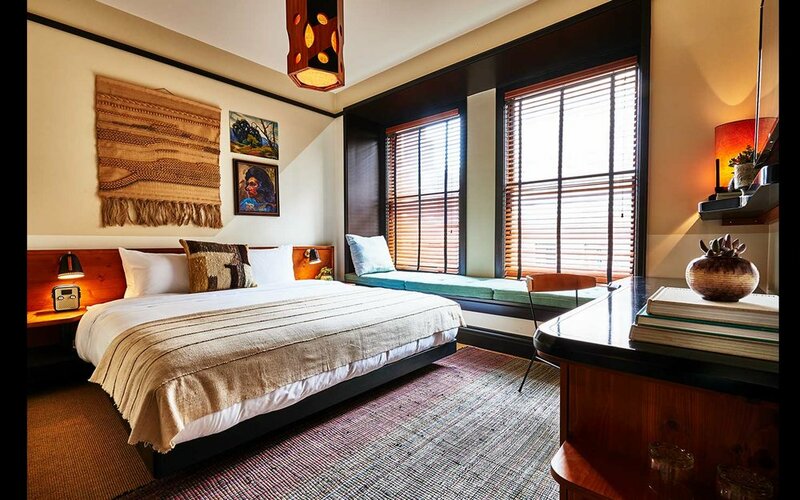 In the guestrooms, rich woods, colorful artwork and wall hangings enliven the walls. Plein air paintings from the 1920’s to the 1960’s adorn the rooms and embrace the west coast tradition of artists creating their work within nature. Custom designed pieces, including sturdy cedar bunk beds, extend and expand from the design language established at the brand’s previous locations. Roman and Williams has enlivened Freehand Los Angeles with the same sense of community that was once active in the Arts and Crafts Movement, celebrating the exchange of past and future. 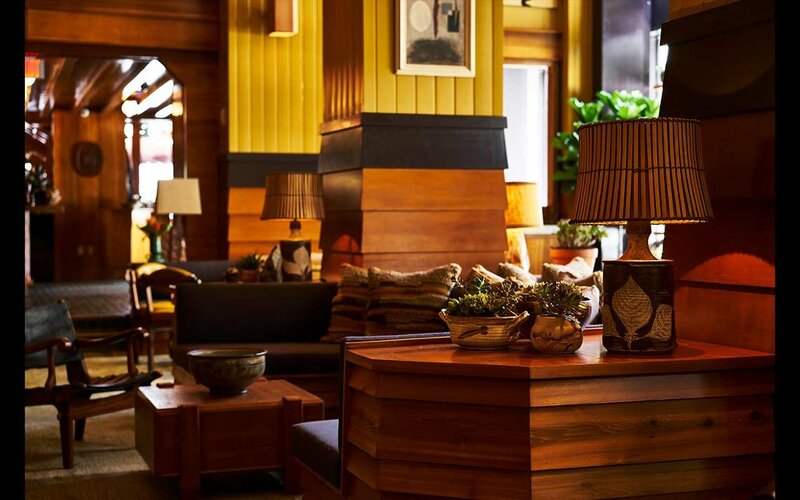 Freehand LA is thoughtful and imaginative, the perfect addition to the current revival of Downtown Los Angeles.